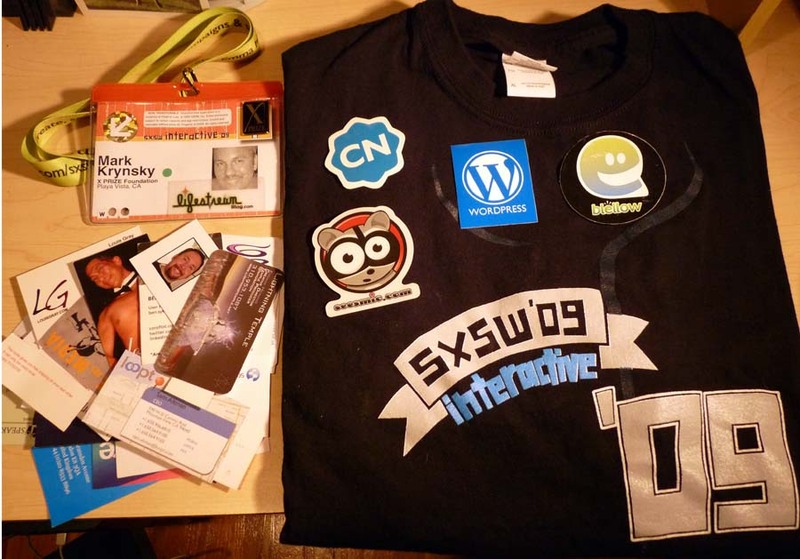 I remember last year when a torrent of tweets began to flood my stream about SXSW. I didn’t know much about the conference at the time but it sure seemed like an awful lot of the people I followed were over there. 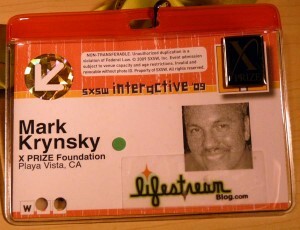 I later read many posts and watched video of the conference and knew I wanted to attend it. 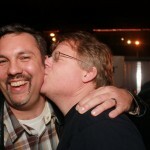 This year I was excited and looking forward to what many call spring break for geeks. But I did however have some specific goals. I wanted to learn about concepts and technologies that were gaining steam and see what new services were being launched. Listen to case studies and get sage advice from peers. 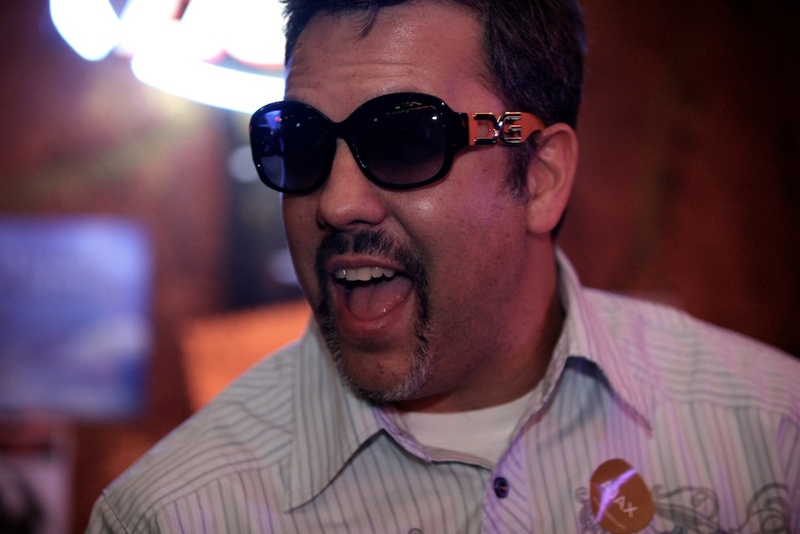 Meet many great folks IRL that I’ve become friends with virtually. 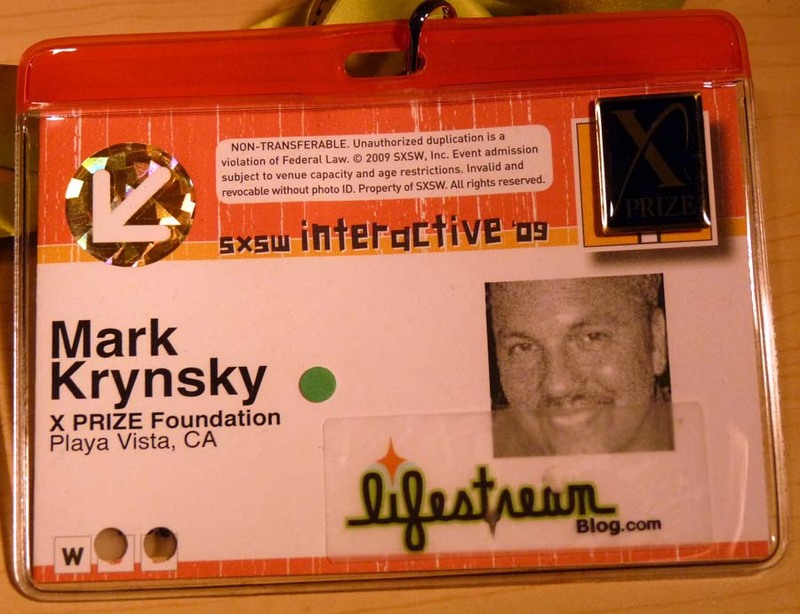 Talk to people about the X PRIZE Foundation and our current and upcoming plans. I’m going to provide my highlights in chronological order as for some reason I find it easier to recollect it that way. I decided to arrive one day early both so I could get a decent night’s sleep as well as complete my registration and get a badge before the show started. Both of these decisions appeared to be very good ones as I saw the massive line formed the next morning on my way to the first panel. 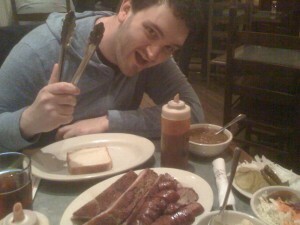 After getting my badge I headed over to Stubbs for my first BBQ which is almost a rite of passage when attending SXSW. I was guided here by my colleague Mike Fabio who joined me at the conference. Mike had already eaten BBQ for lunch and had plans for a BBQ tour de force if you will while in Austin. I must say that the food was fantastic and very different than the BBQ I’ve eaten in LA. Though I will say that my favorite LA joint is Dr. Hogly Wogly’s Tyler Texas BBQ, which is a must vist if you’re out here. From there we both popped out or phones to check what was going on and made our way to Ginger Man. I fell in love the minute I walked in after seeing the massive wall of draft beers available. Mike started us off with Magic Hat #9 and then I moved on to several other ales. While there I met Matt Galligan whom I had communicated quite often during the development of Lifestreaming service SocialThing. 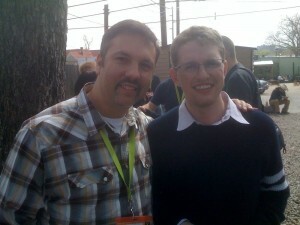 After we talked he went to battle chugging beers with Kevin Rose. Apparently the Boulder contingency seemed to be taking over the bar as I met Jeremy Tanner and Andrew Hyde. I really enjoyed talking to Jeremy and after a few beers I really started to go off on some strange tangents which led to me utter something very strange which Jeremy quickly posted as an OH and I have no idea what the context was anymore, as if that even matters. We then headed back for the hotel where I reviewed my plans for panels to attend with the must use service for the conference at Sched.org. Wake up, hit the lappy to check out what’s up and then off to the convention center we headed. 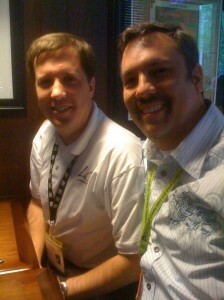 We entered the building and quickly ran into another LA buddy Jason Cosper. Seconds later Marc Vermut joined us as we made our way to BBQ location #2 at Iron Works for a quick lunch before our fist session. The BBQ did not disappoint. Since X PRIZE will be going through a much needed site re-design in the coming months I wanted to see a few panels on where things are headed both with regards to design and content. The first panel I saw was a bit of a let down as it approached design from too high a level. The second panel I went to was run by Paul Arnett of Clearleft titled Unnatural Experiments in Web Design and showcased some very innovative sites that were doing really interesting things I hadn’t seen. Paul also discussed Silverback which is an app that provides what I’ve been told is a great tool for usability testing. During the day I made my way to the TechSet bloggers lounge for the first time. This was the first place where I witnessed the large throng of bloggers and other tech digerati confined to a single room abuzz with activity. This was definitely the place to meet, hang out and chat with folks in a nice relaxed atmosphere before the night descended making it much harder to do in the dark, loud and inebriated states that followed shortly after the conference ended each day. Much thanks to Brian Solis and the rest of the TechSet crew for providing such a great place to hang out throughout the conference as well as for throwing the party I will discuss next. Speaking of drinking… the end of day one concluded and it was off to find our first of many parties which has been the catalyst of what has made SXSW such a legendary conference to go to. We headed for the Techset party at the Belmont lounge. This had to be the biggest party that seemingly attracted the most people. Many areas required breathing in and squeezing to make your way through the crowd. It was here that I began meeting quite a few more people. I spotted Drew Olanoff and went over to introduce myself to be greeted with a huge bear hug. Drew is such a cool guy who recently auctioned off real estate on his arm for a tattoo on Twitter for charity. I was lucky enough to hang out with him some more over the following days. 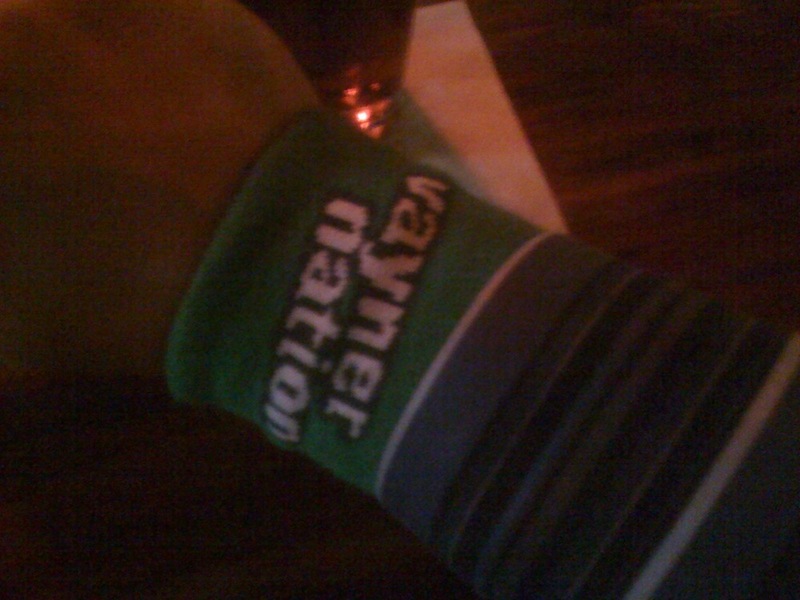 Later I was talking to the aforementioned Jeremy Tanner again when Gary Vaynerchuk came by and handed us his sporty new green wristbands. I was about to reload my drink when I see Corvida walking by who I grabbed and offered up my own hug. I spotted fellow LA techie Sean Percival with his lovely wife and chatted with them a bit. I also had to show them my limited edition autographed Lalawag card. Be sure to visit their site at Lalawag.com which serves up some very interesting details about the LA tech scene. Speaking of which, it was great to have so many of us from the LA crowd in Austin. The LA tech scene has really come a long way in the last few years with many great events and meetups taking place all over the city. In Fact, Andrew Warner & Sloane Berrent were on a panel discussing exactly how LA has transformed into such a great tech community. First panel I headed to was Curating the Crowd Sourced World which sounded intriguing to me and had Gina Trapani on it but unfortunately I was let down. As I would come to find out over time some of the multi speaker panels with moderators were hit and miss. One thing I also came to determine is that instead of focusing so much on the panel topics and catchy descriptions, you are usually better off just identifying great speakers regardless of the topic discussed. Also, I learned that starting your day talking to other SXSW veterans to gather intel on which panels they planned to attend was the best way to determine what to attend. I was upset about too many panels that I was interested in running simultaneously. I’d like to see them spread out more. I ended up taking a gong show approach and gave panels 10 minutes to gain my interest, if they failed then I moved on. I’d like to see SXSW add a site mechanism prior to the conference where users could show interest for a given panel. This could serve a few purposes. For one, it could help guide people, secondly it would help determine the size of a room to have it in. I went to several panels only to find standing room only or if arriving a little late a line formed were ultimately I couldn’t get in. I also didn’t hear about any adequate back-channels for the conference. Sure there was a Meebo room but I heard it wasn’t very active. So after leaving my first panel I headed to one run by Facebook’s Dave Morin. He was discussing the search for a more social web. After his talk was over I spotted the blogging machine that is Louis Gray as he was wrapping up his thoughts for a post on his Macbook. It was the first time I’d met him but it felt like we were old friends who just hadn’t seen each other for a long time. Louis and I headed off to lunch with Allen Stern of Center Networks and Drew Olanoff. Allen was discussing his newly launched Cloud Contacts Service with us and we munched on our food which for the first time was not BBQ related. Later in the afternoon I attended a panel I had been looking forward to titled Feed Me: Bite size info for a hungry internet. It was made up of heavy hitters in the Lifestreaming services arena including representatives from Facebook, Microsoft, Yammer and Paul Buchheit of FriendFeed. I’m a big fan and have been an active user of FriendFeed since the service began and looked forward to hearing Paul’s views. Shortly after the discussion began I decided to live blog it a bit on my iPhone in a post that got imported from Twitter. The discussion veered into the need for open standards with regards to data and I really hope this is achieved soon. We shall see. One of the most entertaining (and informative) panels I saw was the Social Media Nonprofit ROI Poetry Slam. This discussion consisted of several folks using a poetic style to share the social media strategies each of them used for their respective organizations. Representatives from the American Red Cross, National Wildlife Federation, American Cancer Society, and the Humane Society made up the poets. Their presentations included giving specific examples of the services and methods used as well as analytics behind them to show effectiveness. The panel was so good at providing details around their efforts that for profits would have benefited by attending it. After each presenter completed their verbal stylings, a set of judges which included Beth Kanter and Holly Ross provided feedback. Later that evening we headed out to the Cogaoke Karaoke competition that was made up of entrants that were voted on the web to participate. The MC opened the festivities and did a bang up job to get things started but unfortunately things went downhill from there. Many weak performances followed, although there were a few bright spots but overall not quite the caliber of performances to make me want to revisit if they come back next year. This is the risk you run by allowing online voting for entrance into a competition. One of those bright spots I mentioned was Aaron Brazell who provided a nice rendition of Eminem’s Lose Yourself. After Aaron’s performance we got a small crew together made up of many FriendFeeders including Derrick Jefferson, Erin Kotecki Vest, Sean Loyless, and Marco Nunez to find another Karaoke bar to take the bad taste that was left in our mouths. So we headed outside and in three separate groups rented some bicycle chariots and journeyed to our new location. We had a great time hanging out and found a nice place that provided some very good performances which quickly wiped the horrible memory we had shortly before. Nothing exciting to discuss on the panel front from the morning. As I started to get hungry I headed out for the WordPress BBQ Meetup. I decided to walk to this event which ended up being much farther that I had expected but it was worth it. The food was great in a nice outdoor area of a co-working space in Austin called Conjunctured. I hung out again with Jason Cosper as well as Chris Darbo who was telling me about his work at Flexilis which provides security against theft, hacking and other crap from mobile phones. The features we discussed sounded great and I’m really looking forward to becoming a beta tester. I also ran into Paul Arnett whose panel I had seen and mentioned earlier and was able to meet Mr. WordPress himself, Matt Mullenweg. I had a good talk with Matt which included discussing current things at X PRIZE where he remembered having provided the hosting for the Anousheh Ansari Space Blog for us at WordPress.com. I had a great time talking to Matt and many others at the BBQ. The only other Panel this day that made an impact on me was the one run by Gary Vaynerchuk. I had seen videos of other conferences he has spoken at but it’s really something to see him work an audience live. He has energy oozing from every pore and if he wanted could just be a full time motivational speaker. He’s THAT good at it. The funnest part was watching him take questions from the audience where he welcomed the countless people pitching their goods prior to asking a question which is something shunned at all other panels. His quick and direct answers to all questions asked were great amidst the sea of vagueness I had heard in other talks. I was looking forward to the Activity Streams meetup at the end of the day and headed out to where we were supposed to meet just outside the convention center. We had a pretty good sized group and they decided to move it to a nearby restaurant. Unfortunately this wasn’t communicated well and we seemed to have lost many people on the trek over. 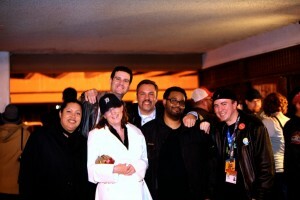 At the meetup were many of the usual suspects whose work I follow as part of my coverage on Lifestream Blog. This included of course Chris Messina (Activitystrea.ms), David Recordon (Six Apart) , Matt Galligan (SocialThing), and Ari Steinberg (Facebook). Unfortunately, all of these guys were at one corner of the table during dinner far from me so I wasn’t able to listen to or discuss anything related to Activity Streams or anything else for that matter. This was a bummer since it was the first time I had met these guys and I would have really liked to hear about the paths each of them was currently working on and how they’re progress is going on pushing the Activity Streams initiative out. Leaving feeling a bit empty from the meetup I was off to yet another party. I was really looking forward to this one being thrown by Chris Pirillo (Gnomedex), Loic LeMeur (Seesmic), Erin Kotecki Vest (BlogHer), and Ping.fm. I was looking forward to meeting many people there. I got to Club De Ville and liked the outdoor venue. It was also not jam packed with people and you could actually hear yourself talking. I spotted Marshall Kirkpatrick and quickly went over to finally meet him. I’m big fan of ReadWriteWeb and they have provided some great coverage of Lifestreaming so it was nice to finally hang out with Marshall. I also talked to Mark Rizzin for a while about his new project which sounds great and I’m really looking forward to. 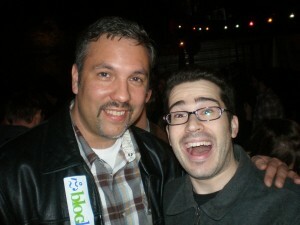 I then saw Chris Pirillo and made my way to say Hi. I’ve enjoyed watching his live performances, viewed his podcasts and written about several of his Lifestreaming projects. We both also are pretty active on FriendFeed. Once again that initial meeting felt like someone I’ve known for a long time. Chris was telling me about a follow up he has planned for his WicketPixie theme. I’m excited about what he has planned as this was the first entrant into the WordPress Lifestreaming theme game which has led to many great additional themes that have since been released. 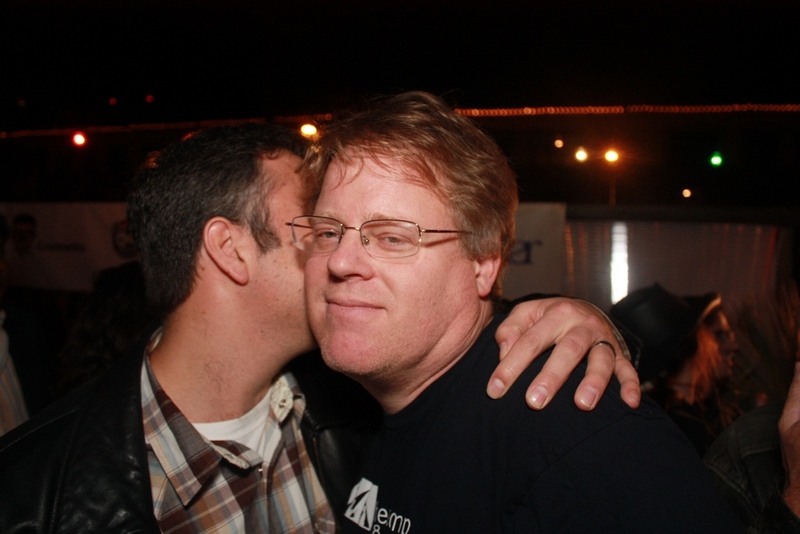 Right as I was talking to Chris and watching his live streaming broadcast I noticed Robert Scoble had just arrived. He made his way over and quickly engaged the users on the live stream. I then tapped his shoulder and introduced myself. This made for an interesting meeting as it all happened on the live stream. Not very exciting for the viewers but a pretty great moment for me having met both Chris and Robert at almost the same time and being the meat in a geek sandwich. I wandered around some more and came across many familiar faces and friends from LA including Andy Sternberg (Live Earth), Andrew Warner (Mixergy), and Mike Prasad (Girl Gamer). I was also fortunate to meet some new LA folks here as well. I met Douglas Campbell who puts on a monthly event that I had heard about in LA called Mindshare. It was great meeting him and learning more about the event. I can’t wait to go to my first one. I also hung out with LA dwellers Evonne Heyning and Geoffrey Emery. Evonne was telling me about her Lightning Temple which sounds like a pretty amazing project. 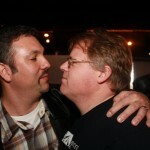 Geoffrey was nice enough to capture a few photos of Scoble and me. This sounded awesome because they were using Drupal, WordPress, and Joomla (2 of which I use) for the competition. So as we made our way to the hall we were stopped dead in our tracks with a long line of people waiting to get in. Another disapointment having to miss what looked to be a great one to watch. I was able to find this review of the panel and the official site created for the panel can be found here. I was in need of some caffeine so Phil and I headed down to the Hilton’s on-site Starbucks. 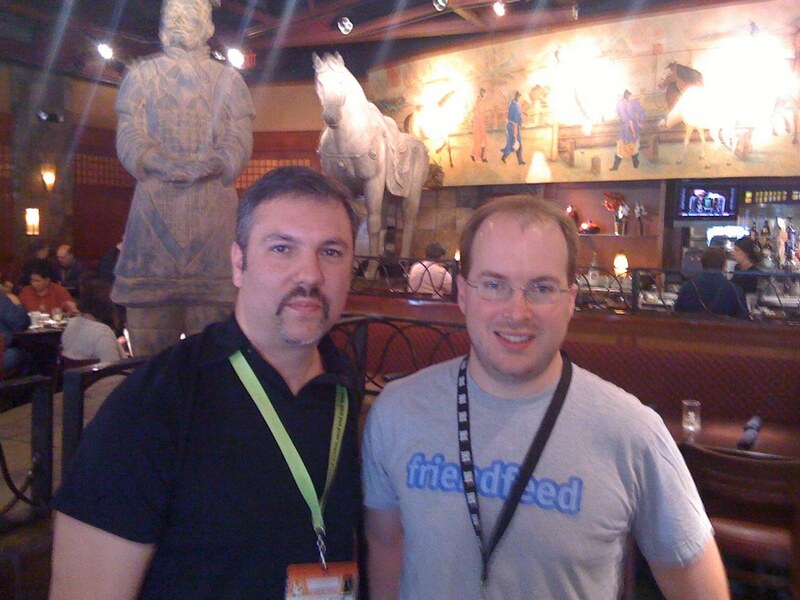 I’m standing in line when I spot Paul Buchheit sporting a FriendFeed t-shirt on. So Phil and I sit down and begin a discussion that covered many topics including developments at FriendFeed. Paul says hello to another guy sitting at the table next to us who happened to be Sam Altman, CEO of loopt. He was telling us about new features and other interesting behind the scenes info of his service. Sam then told us he was headed to meet some friends for lunch at PF Changs and asked if we wanted to come. Phil, Paul and I all decided to join him. After we got to the restaurant we met several guys from Justin.tv and a few other folks I didn’t get details on, but we had a great conversation. It was so valuable and pretty amazing to listen to people provide insight and details about how they run their businesses. You learn some great things just listening to these guys talk. It’s one of the big takeaways from this conference. You really get some of the best value just spending time talking to people outside and in the halls of the conference. After lunch I headed back to the convention center just to walk around for a little bit and say goodbye to people I saw before making my way to the airport. So first off, YES this is an amazing conference to go to and lived up to all the hype I had heard about. I most definitely plan on coming back next year. I mentioned several of the issues with regards to finding the quality panels and being able to attend the over-booked ones but I plan on rectifying those issues next year. I think for a first timer I was really able to get the full effect of the experience which was the main goal. I’m already looking forward to next year. Glad I could make a cameo in your incredibly extensive post, Mark. Wish I had anywhere near the energy to write up something similar. Oh, and I think there's a typo up there on one of those captions. It's supposed to say "FriendFeed MAFIA." Mike, I'm so glad we went to this together. Had a great time with you as always. This post took a ton of focus and perseverance to get done. Took me ~3 weeks and about 6 hours of actual work to complete. I'm happy I did it because having memories of it are great, but now that I recorded them, I can re-live them easier in the future. Hey Kurt, yes that was a great party. So funny hanging out with the whole LA crew out there. Look forward to seeing you again now that we're back. 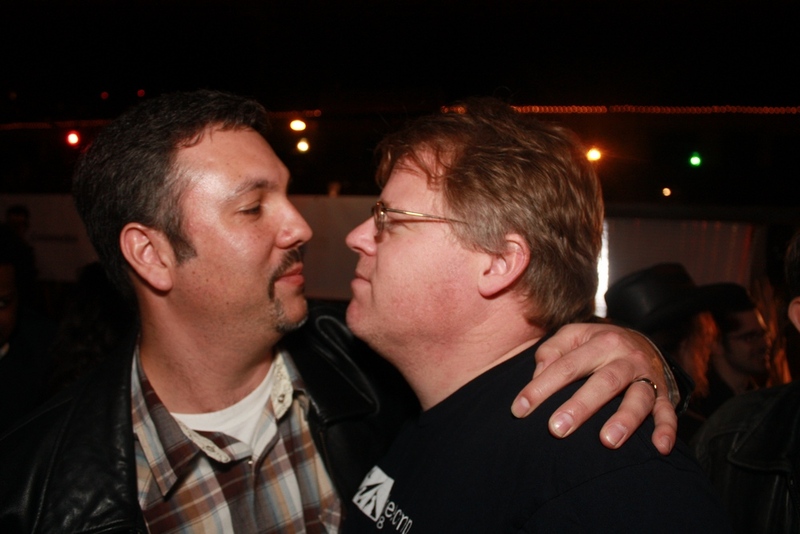 Mark – I apologize if you did not get what you wanted out of our Activity Stream meet up. It was all very impromptu, loosely organized, yes, but it was originally intended to be a meet and greet, not a formal development session. It was great to meet you in person and connect in the real world. Thank you for taking the time to speak to me. 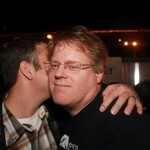 Hey Todd, it was great meeting you too and I appreciate your effort in setting up the meetup quickly. 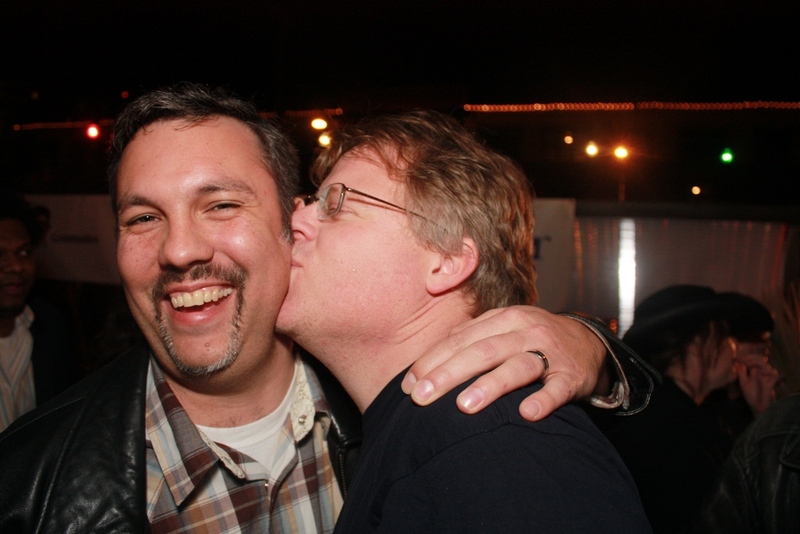 You were the bright spot at this event however I just wish we could have all interacted more. Just gives me an excuse to hang out with all of you again. This is the ultimate web 2.0 name drop session. Good show!